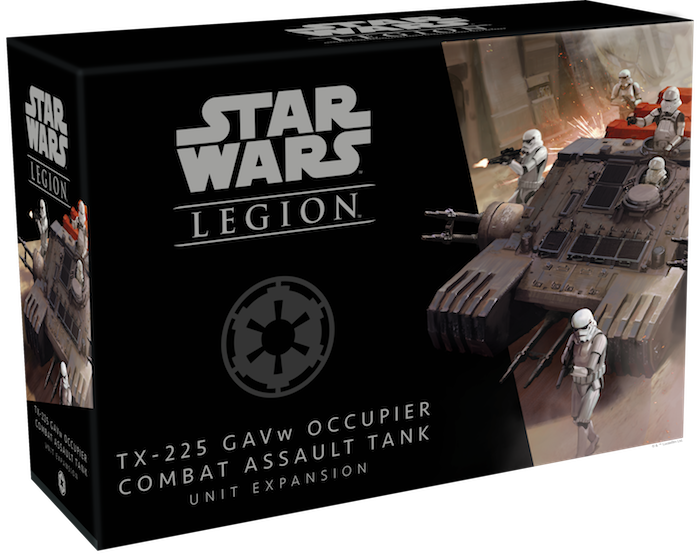 Fantasy Flight Games has announed the upcoming release of the TX-225 GAVw Occupier Combat Assault Tank Unit Expansion for Star Wars™: Legion! No matter how invincible your Imperial army may seem, you're sure to encounter resistance from those who refuse to enter the peace and stability of the Empire. As its name suggests, the TX-225 GAVw Occupier Combat Assault Tank is an essential part of these counterinsurgency operations, able to both lay down heavy fire and provide mobile cover for your troops. The second heavy unit for the Galactic Empire, the Occupier is a cheaper option than an AT-ST, with just as much destructive potential. Although it doesn’t pack quite the punch of its counterpart, every TX-225 features two built-in weapons that are useful no matter what units it’s facing. Its Forward Twin MK 2e/w Cannons are perfect for pinning enemy units in place with suppressive fire. The Lateral Quad MK 2e/w Cannons, meanwhile, can deal some heavy damage—even against armored units. Better yet, both these weapons can be combined into the same attack pool with the Arsenal 2 keyword for a single deadly strike. While these two weapons provide a powerful baseline, they only scratch the surface of the TX-225 GAVw Occupier’s potential as an attack platform. The Combat Assault Tank can be equipped with both a pilot and either a DLT-19 Rifle or a RT-97C Rifle at its hardpoint, giving you even more power over your loadout. No matter what weapon you decide on, your TX-225 GAVw Occupier Combat Assault Tank miniature can reflect your choice, allowing you to customize your mini with both weapons. The customization doesn't stop there, either. You can personalize your own TX-225 with a variety of options for how your gunner and pilots appear on the tank, as well as potentially loading up the cargo bed with three crates of kyber crystals. Despite its ability to launch a concentrated assault on enemy units, the true strength of the TX-225 GAVw Occupier may be in its ability to work with ground troops. As a transport, the tank doesn't have to be hauling kyber crystals—it can also ferry troops into the heart of battle, all while providing a screen for any units that might be following close behind. At the same time that it’s providing cover for your corps units, those same units can screen the Combat Assault Tank from any enemies attempting to outflank its heavy frontal armor. Even without a complement of troops moving with it, opposing forces will still find it difficult to destroy your TX-225. The tank may appear cumbersome, but it is can still turn quickly to protect the exposed treads on its sides after performing a standard move. When it does, you'll also have the chance to block any incoming attacks with the superior red defense dice, ensuring that the tank remains a force to be reckoned with. As the Empire spreads its reach across the galaxy, it must be sure not to lose any star system already under its control. 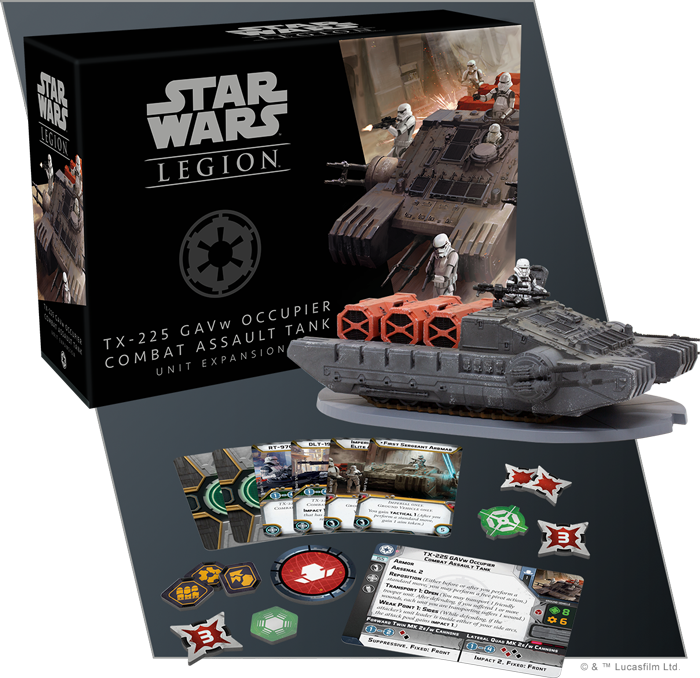 With a TX-225 GAVw Occupier Combat Assault Tank on your side, you can be sure that any planet will remain loyal. Look for the TX-225 GAVw Occupier Combat Assault Tank Unit Expansion (SWL35) to appeat in our shop in the second quarter of 2019, and pre-order your copy by talking to any of our Wizards today!